My Two Pennies: Brit Award 2009 Nominations Announced! 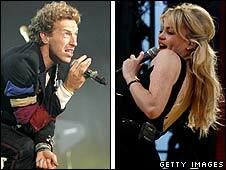 Coldplay and Duffy have bagged four nominations apiece for this year's Brit Awards. Both acts were shortlisted for the British Single and British Album prizes, with Coldplay also receiving nominations for British Group and British Live Act. Duffy, meanwhile, picked up further nominations in the British Female and British Breakthrough Act categories. Adele, Scouting For Girls and Elbow have each been nominated for three awards, while Ting Tings and Estelle have been shortlisted for two. Girls Aloud also received a pair of nominations - for British Group and British Single - with Leona Lewis, Alexandra Burke and the X Factor finalists among the competition in the British Single category. In the international categories, five acts picked up a pair of nominations: Kings of Leon, The Killers, AC/DC, MGMT and Fleet Foxes. Jay-Z and Kanye West will square off for the International Male gong, while Pink, Beyoncé and Katy Perry will compete for the International Female trophy. Pet Shop Boys will take home the Outstanding Contribution to Music prize at this year's Brit Awards, to be held at London's Earls Court on February 18.